Maria's stands at 152 cm (or 5" foot) and has the typical pale vampire complexion. She has gray (and somewhat purple) hair and eyes. Her hair is relaxed, with bangs at eyebrow length and a small bun adorning the side of her head. She possesses the beauty of the aristocrat vampire race and is a very distant relative of Shizuka Hio. She allowed Shizuka to possess her body in exchange to being allowed to drink Shizuka's blood, which would strengthen her sickly body. Due to Shizuka's untimely death, this promise was never fulfilled. Maria has returned to her family after the Shizuka incident. 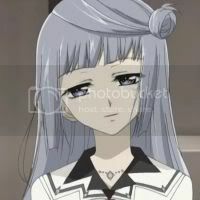 She posseses some affection for Ichiru, as she asked Yuki Cross to tell Zero Kiryu that if he sees Ichiru Kiryu, to tell him Maria wants to see him again. You want 100000000 gold then copy/paste this on ten gaia profile and press f4 then log out and log back in and check your gold!!!!!! it really works!!!!!! 0,000,000g it works im rich!! copy this to 10 profiles so you can get 10,000,000g it works im rich! !copy this to 10 profiles so you can get 10,000,000g it works im rich!! HAPPEH BIRTHDAY! I made you a present, and its on meh profile. Looky looky!! ^^ Hope you have an AWESOME day! !